[Vancouver, B.C. 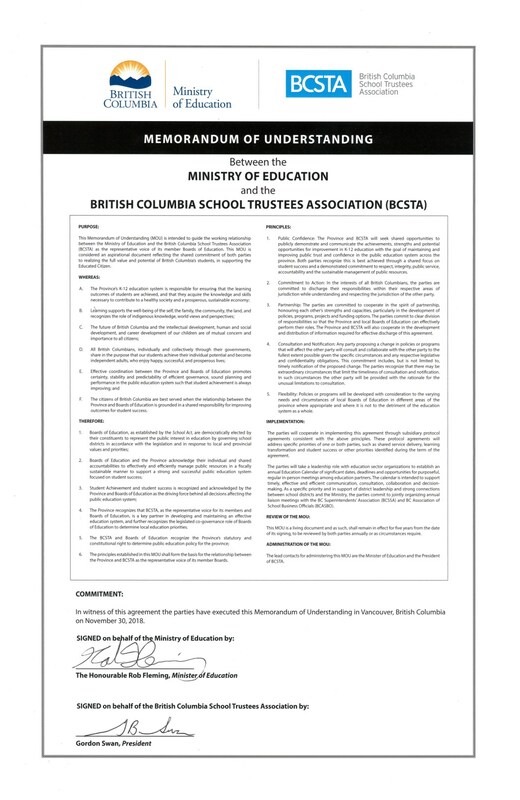 – December 3, 2018] On Friday, November 30, President Gordon Swan of the British Columbia School Trustees Association and the Province’s Minister of Education, the Honourable Rob Fleming, signed an updated memorandum of understanding between BCSTA and the Ministry of Education as part of BCSTA’s academy program. The MOU acts as an agreement on collaboration, cooperation and communication between both organizations. The BCSTA is appreciative of the provincial government’s continued support of public education in B.C. The signing of this document will further strengthen BCSTA’s relationship with the Ministry of Education in the pursuit of improving learning outcomes for all of B.C.’s students. Click here to view the signed memorandum of understanding.